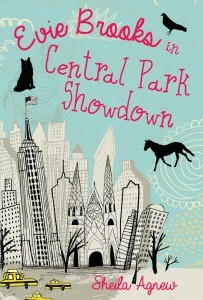 Evie Brooks in Central Park Showdown is the second in the Evie Brooks series by Sheila Agnew. In the first book, Evie Brooks is Marooned in Manhattan, Evie leaves Ireland to live with her uncle, Scott, after her mother dies. In the sequel, while Evie is still adjusting to living in New York, her father (whom she has never met), sues Scott for custody. 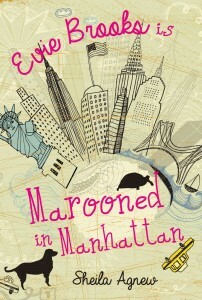 The court case looms in the background as Evie embarks on more Manhattan adventures. She accompanies Scott, who is a vet, to the Central Park Zoo, where he has some challenging patients, including a pregnant alpaca and an ailing red panda. At school she is chided for not talking like an American, and she starts failing math. She’s attracted to two boys—the very charming Loucan, an almost-boyfriend with two pretentious dads—and the very compelling Finn, who treats her like a little sister. As she negotiates her way through school, friends and animal emergencies, the fear of being taken away from Scott in the custody battle gradually takes over her life, and she must call on all her resources to fight for what she wants. This is a funny, engaging book that celebrates the quirky splendour of life in New York as seen through the eyes of a very smart thirteen-year-old….